Last Sunday, March 5th, I completed my first ultra distance trail run. I crossed the finish line at 1:18am. 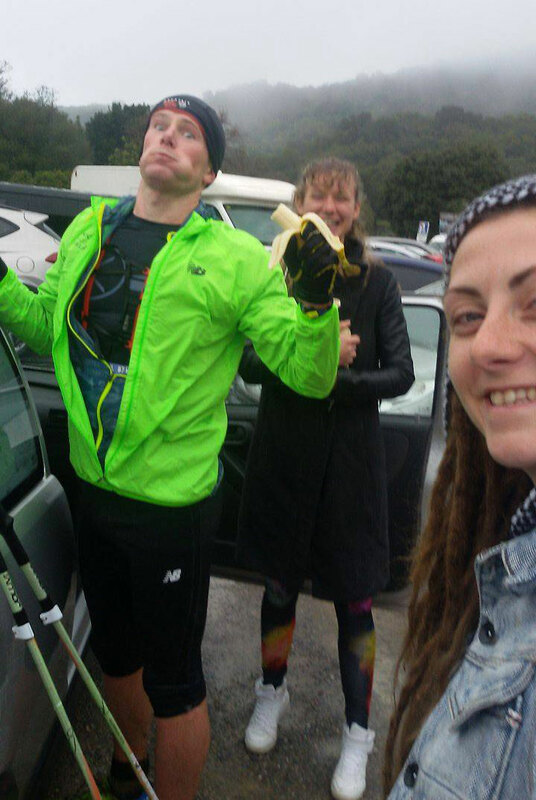 14 hours, 18 mins earlier I juggled doubts at the starting line. 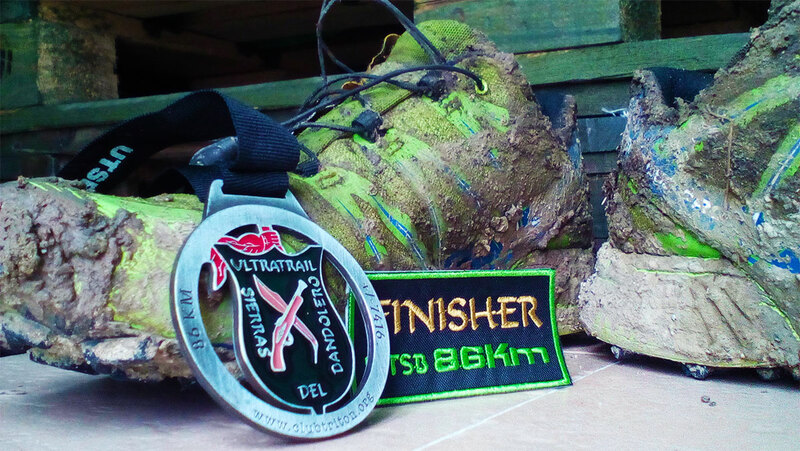 The Ultra Trail Sierras del Bandolero would cover a distance of 86km (54 miles), but with an elevation change of 7,600m (24,000 feet). 3,800m uphill, and 3,800 back down in total. I actually did the ‘short’ course, the Bandolerita. The long course was 166km (100 miles). The longest I had ever run was the Sevilla road marathon two weeks before, over a very flat 42km (26 miles). I would be doubling that distance, and adding a ferocious amount of hills. But I was confident I could complete that mileage on that terrain. The doubts of being able to finish or not came from an unexpected challenge. The weather. All of Friday, and for almost all of Saturday, it poured rain. Thick fog smothered Prado del Rey, the starting point, and the lowest part of the race, meaning the Sierra de Grazalema would be worse. Colder, more rain, more fog. The forecast showed no signs of letting up. We would run in this all day. Could I stay warm? Would my feet turn into a mess after being soaking wet for hours? I took off, already wet, and not too happy by the look of my face here. I’m on the left, yellow jacket, blue hood. My mantra was slow, slow, slow, easy, easy, easy. Not concerned about my position in the race, especially early on. I wore heart rate monitor and kept an eye on my effort regularly. Keeping below my threshold level most of the time. After about 25 minutes I crossed a flooded part of a dirt road. Ankle deep water, no way around. My shoes were completely soaked and would stay that way. I arrived in El Bosque after about an hour, a little ahead of schedule. I checked in to make sure I wasn’t going too hard, everything seemed good. I skipped the first aid station and pressed on. I was carrying 1 litre of water, and energy gels. I knew I was solid until the next aid station, which should take me around 2 hours 50 mins to get to all going well. 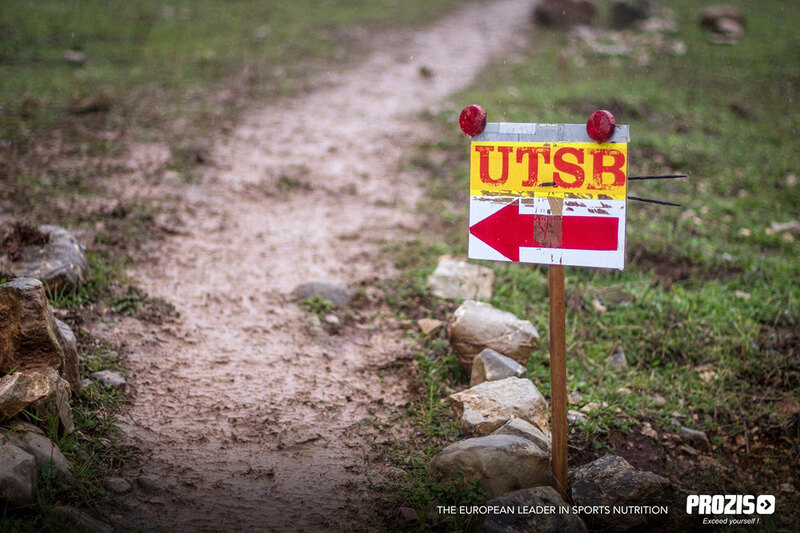 The next section of the course featured some of the most brutal climbs, and lots and lots of mud. Really every section featured lots of mud. The rain kept coming down, but I was moving through the conditions better than expected. It was comforting. I arrived at Llanos del Campo in 2 hours 20 mins. Faster than any training run I’d put in on this bit of track. My heart rate was good though and I felt great. I wasn’t going too fast. 3 hours 20 mins down, and I had my first pit stop. I’m super grateful to Petia and Veronika who came and met me at that aid station. They gave me a pack I had prepared. I refilled water, popped a hydration tab into one of my bottles, wolfed down a banana, replenished energy gels and took off. Despite the usually ridiculously stunning views being hidden by the fog, I was having a lot of fun. The next section featured semi-runnable terrain. Running short flats and downhills, power walking the uphills. Even the elite front runners in these events walk the steeper hills. Over a certain gradient it’s not efficient to run hills. I arrived at aid station three in good time. Topped up water, got some calories in, and started towards Villaluenga del Rosario. This section gave me most concern. 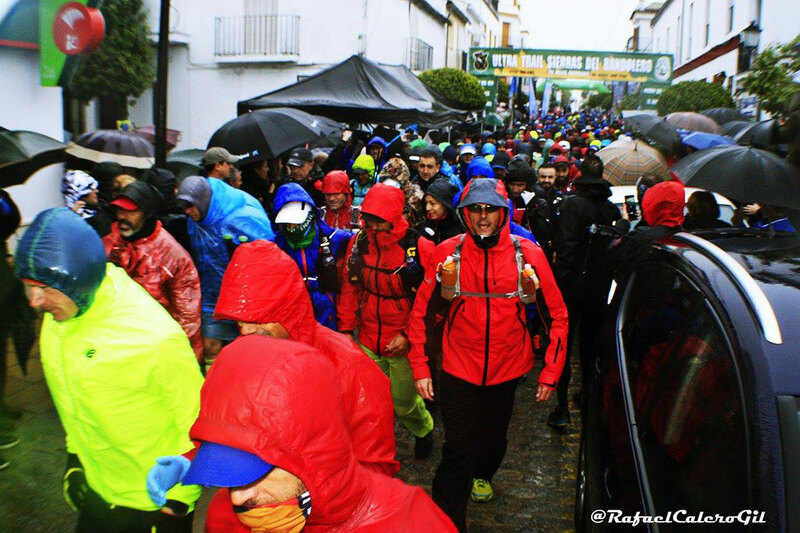 It would be the coldest and windiest, crossing the highest and most exposed terrain of the race. If I avoided hypothermia and made it passed this section I was sure I would finish, as long as I didn’t take a bad fall or mess up my nutrition and hydration. I let myself go faster here to keep warm. I overtook another runner who was walking fairly slowly hugging himself. I asked how he was doing. “Hace mucho frío”, he said. “It’s very cold”. We were still far off the highest mountain pass that would skirt the west side of peak Simancón, heading south. When I reached that pass the wind pushed me off balance and I placed a hand on a rock to re-centre myself. The sharp rain cut almost horizontally into my face, and the cold started to work its way in. I thought back to the cold runner I passed over an hour before and couldn’t imagine him enduring this. I later learned, out of 522 participants, only 245 finished. A 47% finish rate. Most, I expect, dropped out because of the weather. At this point I was worried. If I got cold in the middle of this long section it could be bad. A couple of hours walk each way if the worst happened and I needed help. No mobile phone coverage. I would say 50m visibility at best with the fog and rain. I had been moving for 5 and a half hours. I was moving at a good pace, but felt odd. I’d never exerted myself this much in these conditions. What does hypothermia feel like? Could I feel ok, but just suddenly pass out from tiredness? I didn’t know what my body might do in these conditions. I turned to my breath to focus. To keep planning ahead for the worst, but to stay positive. To trust my training, my body. I peed for the second time during the event. I’m hydrating and remembering to drink. Check. 15 minutes since my last gel. Check. I scanned my body, no pain, or discomfort. My hands are getting warmer, my body is warm. Check, check. Everything seemed good. I used Wim Hof’s breathing technique to help keep warm. Full deep breath in, a relaxed half breath out. After five breaths, I held my breath for 3-5 seconds (as much as I could handle with my level of exertion) and breathed out fully which feels like it pushes warmth around the body. Another five breaths, focus, rinse, repeat. I was joyous when I caught sight of the small white village, Villaluenga. The hardest work was done. The coldest section passed. I would finish. I took a few minutes longer that at previous aid stations, ate, replenished supplies, and took off. The climb back up from their was rough. I felt weak and slow. The first semblance of hitting a wall, which can happen many times in an ultra distance event. I was well fuelled, just needed to be patient and trust when my body had finished some digesting new energy would come. And it did. 30 minutes later I came back to life. I felt new and moved quickly through the mud, rocks, puddles. Power hiked up through streams that were dry hiking paths only two days before. Night approached, headlamp on, night running through a nice light downhill section descending into Grazalema. A lot of fun to actually move at a semi-respectable pace, and nice to have the novelty of nightfall. It made no difference in terms of scenery really, as I’d been staring into white cloudy walls, surrounding me on all sides all day. That fact, along with being so sick and tired of mud and waterlogged paths, made me ask myself several times, why the hell I am doing this? Is there any point to this nonsense? I decided, if I ever do another ultra, I’ll only run in good weather. I have nothing to learn about myself with that kind of misery. I left Grazalema after a good 10 minute stop at station aid. Time for music. My brother Liam put together a playlist for me especially for helping push through the last hours of the race. Rage Against The Machine add some power to my legs as I hike the last serious uphill. Getting close! Here is where I make what I see as my only mistake of the entire race. Sick of plodding through mud, I reached a section I know very well, descending into the town of Benamahoma. I’ve endured hitting another wall and am now full of energy again, excited to be getting close to the finish. I pick up the pace and fly through that section. Amazed I feel so good and can comfortably do a good pace. It feels amazing to actually run normally again and not have mud pulling at my shoes. Arrive in Benamahoma, start down the riverside trail to El Bosque and start to feel leg fatigue and soreness for the first time. The first so far. My eyes are a little sore when I close them now. It’s late, midnight, and I’m getting tired. I hit El Bosque and am not in good shape. I’m well fuelled and hydrated, but very sore. I went too hard on that downhill and am now paying the price. Only a fairly flat 13km from the finish, a section I should be able to run all of, and I end up walking almost all of it. I stop and squat a few times to stretch out knees and hips. It was torturous. The slow pace, the pain. Those never-ending last few km. Prado del Rey came into site, only 2km or so to go. That gave me hope and desire to push and finish with a little respect. I jogged a light downhill 1km, power hiked the last short but steep hill into Prado, make my way into the town centre crossed the finish line. I came in 43rd place over all. I still don’t know if I’ll do something like this again. More than a few people said 100 miles will be my next goal after this, but I have no desire to do that. The pain in my knees for two days after worried me. The fatigue right after finishing was horrible. It was difficult and painful just to shower. By day 3 I felt great, albeit generally tired. Now, a week later, I feel my energy levels are back to normal. That type of race definitely takes a toll on the body, and I’m weighing up how I want to invest my physical training time. More time for AcroYoga and gymnastics, and much less running sounds very appealing. I’m not ruling out another ultra, but I’ll end with this. A message I sent Liam while I was still in pain, knowing with time I’d forget how hard it was. A massive thanks to Lidiya for putting up with all the time I spent out training. To my coach Richard Diaz, check out his podcast if you run or are into obstacle course racing. To Montse who kept my body in amazing condition. To Petia, Veronika and Elena for staying up all night to meet me at the finish line and take me home.